I came across the above old photo of my old ship, the USS Kitty Hawk, as the aircraft carrier was docked in Subic Bay, the Philippines, in 1970 or 1971. 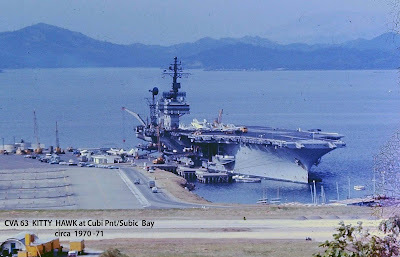 These were the two years I served on the Kitty Hawk, so the photo brought back some fine memories of Subic Bay, of the wild times in the wide open liberty town of Olongapo, and other port-o-calls the carrier made during our WESTPAC (Western Pacific) cruise. We also spent most of our time off the coast of Vietnam, on “Yankee Station” in the South China Sea, performing combat operations against the Viet Cong and the North Vietnamese in support of our in-country troops.